SOME 443.4 million shares worth about RM1.39 billion were traded off market between April 8 and 14 in blocks of at least 500,000 shares. Among the more notable transactions was the movement of 29.98 million shares or a 34.1% stake in Asia Poly Holdings Bhd on April 13 and 14. The shares were transacted in a series of direct deals at between 35 sen and 50 sen each or a total of RM12.91 million. Asia Poly (fundamental: 0.55; valuation: 0.8) manufactures cast acrylic sheets. At press time, the identity of the transacting parties had not been announced to Bursa Malaysia. A local daily quoted sources as saying that the company’s largest shareholder, Tan Sri Lim Tong Yong, had disposed of his entire 25 million shares or a 27.61% stake to Datuk Yeo Boon Leong. Yeo’s family manufactures locks and other hardware under a company called High Reserve Marketing Sdn Bhd. Yeo himself was once managing director of Bandar Kinrara Properties Sdn Bhd. 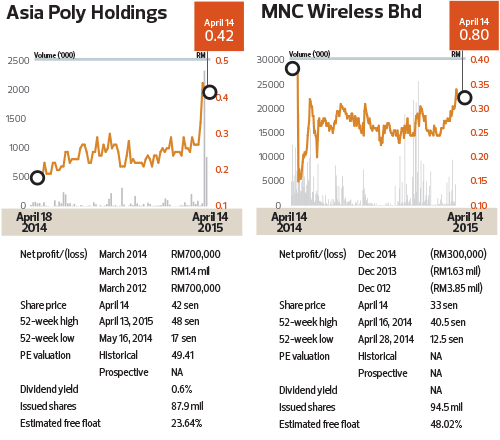 Over at mobile technology solutions developer MNC Wireless Bhd (fundamental: 1.15; valuation: 0.3), 30 million shares or a 31.76% stake changed hands on April 8. The shares crossed at 32 sen apiece in a series of direct deals, amounting to a total of RM9.6 million. According to filings with Bursa, MNC Wireless’ largest shareholder, Grand Sino Investment Ltd, has sold its entire stake of 30 million shares in the company. It is unclear who bought the shares. Metronic Global Bhd (fundamental: 1.25; valuation: 0.6) surfaced as MNC Wireless’ second largest shareholder in February and has since raised its stake to 16.1%. On April 14, Acoustech Bhd (fundamental: 2.25; valuation: 1.8) saw 7.93 million shares or a 4.71% stake change hands in a direct deal at 62 sen apiece or a total of RM4.92 million. The company, which produces audio speakers, has yet to make an announcement to Bursa. Elsewhere, Signature International saw 5.5 million shares or 4.58% equity interest trade off market on April 8, 9 and 14. The shares were transacted at between RM2.23 and RM2.33 each in a series of direct deals that valued the block at RM12.32 million. According to filings with Bursa, HSC Healthcare Sdn Bhd disposed of 1.5 million shares in Signature International (fundamental: 2.3; valuation: 1.8) on April 8 and another million the next day, leaving it with a 7.01% stake in the furnishing and appliance maker. HSC has been paring its stake in the company since January when it held 16.75% equity interest. On April 8 and 13, construction outfit JAKS Resources Bhd (fundamental: 0.65; valuation: 1.8) saw the movement of 14.5 million shares or a 3.31% stake off market. The shares were transacted at between 58 sen and 65 sen each in a cross trade and direct deals and were valued at RM8.87 million in total. No announcements had been made at press time. TH Heavy Engineering Bhd (fundamental: 0.35; valuation: 1.2) saw 35.7 million shares or a 3.21% stake in it move off market on April 8, 9, 10 and 14. The shares changed hands at 33.5 sen apiece in a series of direct deals, valuing the block at RM11.96 million. The transacting parties were not disclosed at press time. Note: The Edge Research’s fundamental score reflects a company’s profitability and balance sheet strength, calculated based on historical numbers. The valuation score determines if a stock is attractively valued or not, also based on historical numbers. A score of 3 suggests strong fundamentals and attractive valuations. Go towww.theedgemarkets.com for more details on a company’s financial dashboard. This article first appeared in Capital, The Edge Malaysia Weekly, on April 20 - 26, 2015.